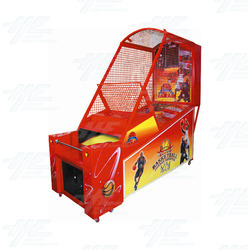 The basketball is also available in matrix version with colour matrix display, which presents animations of slam dunks, three point throws and many other stunning pieces of NBA style play. Basketball attracts with blinking RGB LEDs and sound effects. The awarded basketball is distinctive by interesting colour schemes, colour matrix display and LED illumination as well as total water tightness. To prove to customers that the basketball machine is resistant to all, even extreme weather conditions the factory immersed one machine in water. Even during continuous flooding the machine was still running without any defects. Moreover, basketball is made from state of the art materials, has so called moving basket and enables linking of few machines and the installed matrix display cause that the machine stands out from against other products of this type on the world. The machine was initially presented on SUREXPO 2007 trade fair in Warsaw, where it has aroused the highest interest of the trade fair Jury. The awarded basketball is distinctive by interesting colour schemes, colour matrix display and LED illumination as well as total water tightness. To prove to customers that the basketball machine is resistant to all, even extreme weather conditions the factory immersed one machine in water. Even during continuous flooding the machine was still running without any defects. Moreover, basketball is made from state of the art materials, has so called moving basket and enables linking of few machines and the installed matrix display cause that the machine stands out from against other products of this type on the world. The machine was initially presented on SUREXPO 2007 trade fair in Warsaw, where it has aroused the highest interest of the trade fair Jury.